Earning an online doctorate in curriculum and instruction is terrific preparation for professional advancement into administrative or leadership positions in PreK-12 private and public school systems, teaching positions at colleges and universities, or in the curriculum and instruction research field. A doctoral program prepares education professionals to evaluate and design curricula that creates optimal learning conditions for all students. With a large grade school population and a number of educationally underserved populations, the need for qualified individuals in curriculum and instruction is greater than ever. Graduates of an online Ph.D. in education curriculum and instruction are ready to make significant and positive changes in the field of education. As a result, they pursue careers as curriculum specialists, instructional supervisors, school administrators, professors, researchers, and more. Additionally, earning a degree online allows busy professionals to pursue their education with a flexible schedule that can accommodate the demands of their career. What Is an Online Doctorate in Curriculum and Instruction? What Can You Do With a Doctoral Degree in Curriculum and Instruction? University of Florida – College of Education ranks #1 on The 10 Best Online Doctorate in Curriculum & Instruction Programs! The College of Education at the University of Florida offers undergraduate, graduate, and professional programs covering a diverse array of fields in education through its three schools, including: the School of Human Development and Organizational Studies in Education; the School of Special Education, School Psychology, and Early Childhood Studies; and the School of Teaching and Learning. With a history dating back to the consolidation of two teacher preparation programs in 1905, the College of Education builds its programs on a long tradition in the field. The College provides students with numerous opportunities for growth and development, including online programs, internship and scholarship options, professional development services, outreach programs, and access to a variety of research centers, including the Lastinger Center for Learning. The School of Teaching and Learning offers an online Doctor of Education in Curriculum and Instruction with a specialization in Curriculum, Teaching, and Teacher Education degree program for education professionals seeking to advance their careers as leading figures in curriculum and instruction. The program develops advanced knowledge with an emphasis on professional practice through comprehensive coursework covering theoretical and practical approaches, as well as in-depth research through a dissertation project. The curriculum covers such key topics as education in American culture, issues in school reform, approaches to curriculum and instruction, instructional assessment, teaching in under-resourced schools, and more. Students prepare to pursue a variety of careers, including school or district leader, curriculum specialist, and instructional supervisor. Students in the online Doctor of Education in Curriculum and Instruction program must complete a dissertation and defense. Students must attend three weeklong summer residencies. Students can complete the program in four years. Students seeking to enroll in the online Doctor of Education in Curriculum and Instruction program must have a relevant Master’s degree from a regionally accredited institution, three years of professional experience in the field of education, and current employment as a full-time educator. The Doctor of Education program is accredited by the National Council for Accreditation of Teacher Education (NCATE) since 1954, and by NCATE’S successor, the Council for the Accreditation of Educator Preparation (CAEP) since 2013. The University of Florida is accredited by the Southern Association of Colleges and Schools Commission on Colleges (SACSCOC). Texas A&M University – College of Education and Human Development ranks #2 on The 10 Best Online Doctorate in Curriculum & Instruction Programs! Established in 1969, the College of Education and Human Development offers years of tradition and experience in education with undergraduate, graduate, and professional programs. Housing four departments, the College covers a diverse array of fields under the education umbrella, including: Educational Administration and Human Resources; Educational Psychology, Health and Kinesiology; and Teaching, Learning, and Culture. The College of Education and Human Development provides students with unique opportunities for development through internship and scholarship opportunities, as well as a variety of flexible online programs, outreach programs, and research centers, such as the Center for Research and Development in Dual Language and Literacy Acquisition. The Department of Teaching, Learning, and Culture offers an online Doctor of Education in Curriculum and Instruction degree program designed for professionals in K--12 public and private education who seek to advance their careers as leaders in the curriculum and instruction field. The program blends theoretical discussion of the field, practical applications, and hands-on learning through internships and a record of study project. Coursework for the program develops advanced knowledge through covering key topics, such as instructional leadership, problem-based research frameworks, curriculum assessment and development, theories of research, and grant writing. Students prepare to advance professionally, pursuing high-level careers in education, such as school administration, instructional specialist, and curriculum developer. Students in the online Doctor of Education in Curriculum and Instruction program must complete two internships and a record of study. The program utilizes a cohort model. Students can complete the program in four years. Students must also attend three face-to-face orientations during the course of the program. For admission into the online Doctor of Education in Curriculum and Instruction program, students must have five years of professional experience, preferably in PreK--12 schools, and a relevant Master’s degree from a regionally accredited institution. Texas A&M University is accredited by the Southern Association of Colleges and Schools Commission on Colleges (SACSCOC). University of Buffalo SUNY – Graduate School of Education ranks #3 on The 10 Best Online Doctorate in Curriculum & Instruction Programs! Founded in 1931, the Graduate School of Education at the University of Buffalo SUNY offers a long history of experience and tradition in teacher preparation, meeting the needs of a diverse body of students with undergraduate, graduate, and professional programs of study. The Graduate School of Education covers a wide range of topics and fields under the education umbrella through four departments, including: Counseling, School, and Educational Psychology; Educational Leadership and Policy; Library and Information Studies; and Learning and Instruction. With numerous online program options, internship and scholarship options, professional development services, outreach programs, and research centers, such as the Center for Literacy and Reading Instruction, the Graduate School of Education provides students with plenty of opportunities for growth and advancement. The Department of Learning and Instruction provides an online Doctor of Philosophy in Curriculum, Instruction, and the Science of Learning degree program with four concentration options, in General CISL, English Education, Math Education, and Science Education. The program meets the unique needs of each student and their career goals, incorporating a flexible path of study developed between the individual student and their advisor. Students engage in coursework covering fundamental concepts, including curriculum design, instructional assessment, and scientific approaches to curriculum and instruction, as well as specialized coursework in areas such as new literacies, educational informatics, social learning and culture, and situated cognition. Students prepare to pursue a variety of general and specialized careers in education, including instructional supervisor, school administrator, and curriculum specialist. Students in the online Doctor of Philosophy program must complete a dissertation and defense. For application into the program, students must hold at least a relevant Bachelor’s degree from a regionally accredited institution. Students may earn a Master’s degree as they complete the Doctoral program. The University of Buffalo SUNY is accredited by the Middle States Commission on Higher Education (MSCHE). University of South Carolina – College of Education ranks #4 on The 10 Best Online Doctorate in Curriculum & Instruction Programs! The College of Education at the University of South Carolina provides undergraduate, graduate, and professional programs in diverse fields in education, including physical education, special education, and curriculum and instruction. The College of Education provides students with plenty of beneficial opportunities for growth through a variety of internship and practicum options, outreach initiatives and educational partnerships in the community, and research centers. The College of Education offers a Doctor of Education in Curriculum and Instruction online degree program with a concentration in Curriculum Studies designed for professionals working in the education field who seek to advance their careers as curriculum specialists in a variety of professional settings. The program utilizes a curriculum informed by the Carnegie Project on the Education Doctorate Consortium (CPED) and covers key topics such as instructional design and assessment, curriculum leadership, and practical and theoretical approaches to curriculum design. The program places strong emphasis on the importance of understanding, acknowledging, and accommodating diversity in the classroom and through curriculum design. Students prepare to pursue a variety of careers as curriculum specialists in areas such as PreK--12, higher education, and private education. Students must complete a comprehensive exam, dissertation, and defense. For admission into the online Doctor of Education in Curriculum and Instruction program, students must hold a relevant Master’s degree from a regionally accredited institution. The College of Education is accredited by the National Council for Accreditation of Teacher Education (NCATE). University of South Carolina is accredited by the Southern Association of Colleges and Schools Commission on Colleges (SACSCOC). New Mexico State University – College of Education ranks #5 on The 10 Best Online Doctorate in Curriculum & Instruction Programs! Founded in 1956, the College of Education at New Mexico State University offers over half a century of tradition in undergraduate, graduate, and professional programs in education. Composed of five departments, the College of Education represents a diverse array of fields under the education umbrella, including: Counseling and Educational Psychology; Special Education and Communication Disorders; and Curriculum and Instruction. The College participates in research and community engagement through programs such as the STEM Center, and the Alliance for Teaching and Learning. The Department of Curriculum and Instruction offers an online Doctorate in Curriculum and Instruction degree program resulting in a Doctor of Education or a Doctor of Philosophy degree. Designed for mid-career professionals, the program prepares students with the advanced knowledge necessary to pursue a variety of upper-level careers in education. The curriculum includes theoretical and practical approaches through coursework covering topics such as curriculum mediation, curriculum and diversity, social justice issues, and education and technology, as well as in-depth research through dissertation work. Students must complete a dissertation and defense, as well as three one-week summer residencies. For admission into the online Doctoral in Curriculum and Instruction program, students must hold a Master’s degree in Education, and have three years of teaching experience at the PreK--12 or post-secondary level. The programs in the College of Education have been accredited by the National Council for Accreditation of Teacher Education (NCATE) since 1962, and by NCATE’S successor, the Council for the Accreditation of Educator Preparation (CAEP) since 2013. New Mexico State University is accredited by the Higher Learning Commission (HLC). Regent University – School of Education ranks among The 10 Best Online Doctorate in Curriculum & Instruction Programs! The School of Education at Regent University provides students with a variety of undergraduate, graduate, and professional program options in diverse fields in education. Building on the Christian mission of Regent University, the School of Education maintains a commitment to developing well-qualified leaders in education with programs built on Christian principles. The School of Education provides students with the benefits of internship and practicum opportunities, scholarship opportunities, flexible online programs, and more. The School of Education offers an online Doctor of Philosophy in Education degree program with a concentration in Curriculum and Instruction for students seeking to advance careers in education. The program utilizes classroom teaching, as well as in-depth research through dissertation work. The curriculum develops advanced knowledge in curriculum and instruction through courses that cover diversity and inclusion, program evaluation, curriculum assessment, theories of development, and more. Students prepare to pursue or advance careers in a variety of professional roles and settings, including university education, curriculum and instruction consultant, school district administration, and more. Students must complete a dissertation and defense, as well as three one-week residencies. For admission in to the online Doctor of Philosophy in Education program, students must have a relevant Master’s degree. Regent University is accredited by the Southern Association of Colleges and Schools Commission on Colleges (SACSCOC). University of Louisiana at Monroe – School of Education ranks among The 10 Best Online Doctorate in Curriculum & Instruction Programs! The School of Education at the University of Louisiana at Monroe provides students with a host of undergraduate, graduate, and professional program options in diverse fields of study in education, including early childhood, reading, special education, educational leadership, educational technology, English as a second language, and curriculum and instruction. Housed in the College of Arts, Education, and Sciences, the School of Education offers students unique benefits, such as internship, practicum, and scholarship opportunities, career development services, flexible online programs, and research grants. The School of Education offers an online Doctor of Education in Curriculum and Instruction degree program designed for mid-career professionals seeking to advance their careers through higher education. As a 100-percent online program, students may complete their education without having to fulfill residency hours on campus. The program develops advanced knowledge in the area of curriculum and instruction through focused coursework and a dissertation project composed of the individual student’s research. The curriculum includes courses in instructional design and technology, research methods, effective teaching principles, ethical decision-making, and education and diversity. Students prepare to advance careers in a variety of professional roles, including educational administration, curriculum development, instructional supervision, and more. Students in the online program must complete a dissertation project and defense. For admission into the online EdD in Curriculum and Instruction program, students must have a Master’s degree in Education or related field. The Doctor of Education in Curriculum and Instruction degree program is accredited by the National Council for Accreditation of Teacher Education (NCATE) and the Council for the Accreditation of Educator Preparation (CAEP). The University of Louisiana at Monroe is accredited by the Southern Association of Colleges and Schools Commission on Colleges (SACSCOC). 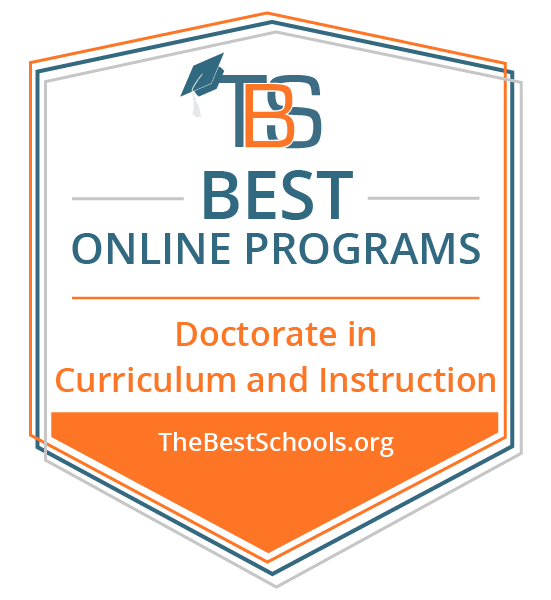 University of West Florida – College of Education and Professional Studies ranks among The 10 Best Online Doctorate in Curriculum & Instruction Programs! The College of Education and Professional Studies at the University of West Florida offers a variety of undergraduate, graduate, and professional programs across eight departments representing diverse fields, including: the Department of Criminology and Criminal Justice; and the Department of Research and Advanced Studies. The College serves students through on-campus as well as flexible online programs committed to career-readiness, internship and scholarship opportunities, and access to community outreach programs. The Department of Research and Advanced Studies offers a Doctor of Education in Curriculum and Instruction online degree program with a specialization in Curriculum and Assessment for education professionals seeking to advance their careers. The program develops advanced knowledge in the areas of curriculum and instruction through a blend of core and specialized coursework, theoretical and practical approaches, and in-depth dissertation research. The curriculum covers key topics such as curriculum design, alternative assessment, the history of American education, and contemporary issues in the field. Students prepare to pursue careers in public and private school settings as administrators, curriculum specialists, and more. The courses in the online Doctor of Education in Curriculum and Instruction program utilize an eight-week model. Students in the program must complete a dissertation and defense. The College of Education and Professional Studies is accredited by the National Council for Accreditation of Teacher Education (NCATE). The University of West Florida is accredited by the Southern Association of Colleges and Schools Commission on Colleges (SACSCOC). Liberty University – School of Education ranks among The 10 Best Online Doctorate in Curriculum & Instruction Programs! The Department of Teacher and Graduate Education at Liberty University provides students with a variety of undergraduate, graduate, and professional program options to pursue general and niche educational fields. The Department’s programs prepare students to enter a variety of roles in K--12 education, university education, specialized fields of study, public education, private education, and more. Housed in the School of Education, students in the Department benefit from access to internship and study abroad programs, career development resources, and more. The Department maintains a commitment to Liberty University’s Christian mission, advancing Christian values and principles in education. Through the Liberty University Online platform, the Department of Teacher and Graduate Education offers an online Doctor of Education degree program with a Curriculum and Instruction Cognate. The program develops advanced knowledge and expertise in the area of curriculum and instruction through a balance of theoretical and practical coursework and in-depth doctoral-level research. The curriculum covers topics such as educational leadership and its history and social foundations, as well as curriculum theory, curriculum change, conflict resolution, and leadership principles and ethics. The program culminates in a dissertation project and defense, based the individual student’s research interests. Students prepare to pursue or advance a variety of careers in the education field, including curriculum specialist, instructional supervisor, school administrator, and university professor. Students in the program must complete a comprehensive exam, dissertation project, and dissertation defense. For admission into the online Doctor of Education program, students must have completed or be near completion of a Master’s degree in a relevant field. The Doctor of Education degree program is accredited by the National Council for Accreditation of Teacher Education (NCATE). Liberty University is accredited by the Southern Association of Colleges and Schools Commission on Colleges (SACSCOC). Carson-Newman – Adult and Graduate Studies ranks among The 10 Best Online Doctorate in Curriculum & Instruction Programs! Adult and Graduate Studies at Carson-Newman University serves students pursuing continuing education, offering a variety of undergraduate, graduate, and professional program options. With online programs, internship and scholarship opportunities, and professional development services, Adult and Graduate studies meets the unique needs of non-traditional students. Adult and Graduate Studies offers an online Doctor of Education degree program with a concentration in Curriculum and Instruction Leadership. Designed to meet the needs of educational professionals seeking career advancement, the program incorporates a blend of in-depth coursework, hands-on research, and field experience through an internship. Students develop key advanced knowledge in subjects such as designing and applying research, leadership models, implementing curriculum change, and theories and practice of educational leadership. Students prepare to advance professionally in the education field, in careers such as curriculum specialist, instructional supervisor, school administrator, and university professor. Students in the online Doctor of Education program must complete a mentored internship and dissertation. The program utilizes an eight-week model for its courses. Carson-Newman University is accredited by the Southern Association of Colleges and Schools Commission on Colleges (SACSCOC). The Doctor of Education degree program is accredited by the National Council for Accreditation of Teacher Education (NCATE). Students earning an online doctorate in curriculum and instruction degree learn to assess, design, and implement changes in curriculum and instruction, often for preK-12 educational programs. Graduates emerge with either a doctor of philosophy (Ph.D.) or doctor of education (Ed.D.) degree, which signifies they have completed the highest level of study in their field. Programs typically cover subjects such as instructional leadership, curriculum assessment and development, research theories, qualitative methods in curriculum and instruction, instructional design and technological integration, and curriculum and diversity. Students devote significant time to research in the curriculum and instruction field, and they hone their abilities in curriculum evaluation. Typically designed to meet the needs of midcareer professionals in education, an online doctorate in curriculum and instruction program combines advanced online coursework with a culminating dissertation or practicum experience that integrates theory and practice. Prospective students should note the varying career tracks open to those with a Ph.D. or an Ed.D. For example, a Ph.D. in curriculum and instruction often leads to a career in research or a teaching position at a college or university. Meanwhile, learners with an Ed.D. in curriculum and instruction typically fill administrative or leadership positions in education as well as positions in curriculum design and instruction. Job seekers with an online doctorate in education curriculum and instruction pursue a variety of exciting careers. In a variety of positions including teaching and administrative roles, these professionals carry out many essential functions in public and private school systems as well as education-focused companies around the world. Workers in this field are organized team players. They focus on the needs of their schools or organizations and develop coherent strategies to meet their goals. The following list highlights some popular careers for graduates of online doctoral programs in curriculum and instruction. Curriculum Director: These professionals design and implement effective educational frameworks in the classroom. They coordinate projects with senior management and assist with teacher training courses. Assessment Specialist: These specialists work for schools and private education companies to develop educational performance assessment materials. They test to determine student placements and assess their progress over time. Many assessment specialists have prior teaching experience. Instructional Designer: Instructional designers develop and implement various types of learning curricula or modules based on scientific research. They work for schools and companies to develop learning materials for children, adults, employees, and customers based on needs and company strategies. High School Principal: Principals oversee virtually every aspect of high school administration. They work to improve the educational environment around their schools and offer disciplinary actions for students, teachers, and staff as needed. Superintendent: These administrators, as heads of the school system or district, work full time around the year on staffing issues, hiring and removing employees as needed, and budgetary plans. They work with school boards and principals to make sure schools meet their educational goals within their budgets. When researching a Ph.D. in curriculum and instruction online program, consider your schedule and availability, learning style, and financial situation. Some programs offer entirely online programs that distance learners complete from virtually any location with internet access. Alternatively, hybrid formats require some in-classroom work. Be sure your program also offers what is best for your lifestyle. Students with financial concerns may find it advantageous to look into in-state programs, as these tend to be the most affordable options. Whichever route you choose, you should set aside several weeks to research programs before you apply. Students spend several years in doctoral programs, and you want to find a school that meets your educational and financial needs. Program Cost: The cost of online doctoral programs in curriculum and instruction vary significantly between schools. Some may cover the cost of tuition completely for doctoral students, while others can charge out-of-state tuition rates that are double in-state tuition. If the financial aspect of graduate school concerns you, search for low in-state tuition rates. Alternatively, you may locate programs that charge the same for all distance learners regardless of their location. Transfer Policies: Students with previous college courses from accredited programs can save time and money provided they meet the transfer credit policies of their school. In many cases, online doctorate in education curriculum and instruction programs honor transfer credits recently earned with a "B" average or higher. If you plan on transferring credits, be sure to locate and understand your prospective school’s transfer policy. School Size and Type: Public and private schools often feature different class sizes for online courses. In many cases, smaller private schools offer fewer vacancies in online courses to make a professor’s job more manageable. Public schools may offer multiple sections of one class, with multiple professors handling the workload. One is not better than the other, but smaller classes may result in a more competitive admissions process. Program Length: Depending on the graduation requirements, most full-time students complete the Ph.D. in curriculum and instruction online in 3-5 years. Part-time students spend more time finishing classes and other requirements and may spend up to seven years in a graduate program. Graduate schools often establish a maximum number of years a student may pursue a degree before their earned credits begin to expire. On-Campus Requirements: In hybrid programs, students take one or more classes in person in a classroom. While most curriculum and instruction degrees feature entirely online programs, some learners may prefer to split their time between remote work and classroom instruction. Considering on your learning style and schedule, find a school where the format fits your needs. When researching prospective schools, distance learners should consider only college and universities with regional or national accreditation. These designations ensure that your program meets certain academic standards and offers quality training. The more prestigious designation is regional accreditation, often awarded to schools with academically focused programs at the associate through doctoral levels. Nationally accredited schools also meet high standards of educational quality and typically offer career-focused programs. Online doctoral programs in curriculum and instruction may also hold programmatic accreditation from the Council for the Accreditation of Educator Preparation. Both private organizations and the federal government take part in the accreditation process. The Council for Higher Education Accreditation (CHEA) is a private membership organization that represents over 3,000 colleges and universities and 60 institutional and programmatic accrediting organizations. CHEA holds institutions to high educational standards and ensures a positive relationship with other accrediting bodies and the government. The Department of Education (ED) approves accreditors, both national and regional, and ensures they possess the expertise to determine educational quality. In order for students to receive federal aid from the government, their school must hold accreditation from an ED-recognized body. How Long Does It Take to Get a Doctoral Degree in Curriculum and Instruction? The duration of your online Ph.D. in education curriculum and instruction program depends on your availability and the graduation requirements set forth by your department. Doctoral distance learners typically complete 90-120 credits over the course of 3-4 years. In addition to coursework, Ph.D. degree seekers usually need to complete a final capstone project or write a traditional doctoral dissertation. The research and writing for the dissertation, alone, may take up to two years. While all students progress through doctoral programs at different rates, especially during their final years, full-time distance learners can expect to spend no less than four years earning the degree. Students learn about the impact of legislative and socio-political forces on how schools develop curricula, learning activities, and class structure. The course covers both new theories and time-tested models of instruction for learners of all ages. Doctoral students also learn about classroom diversity and focus on the experiences of underrepresented groups based on race, ethnicity, socioeconomic status, and sexual orientation. The course examines behaviors that influence students’ academic achievement. Degree candidates learn effective pedagogical techniques and various classroom strategies. Additionally, degree seekers develop data collection techniques.This class takes place in a classroom or school setting, either in a student’s current position or a location approved by their adviser. Students explore the main types of discourse analysis, including conversation analysis, critical discourse approaches, and rhetorically informed discourse. Doctoral students learn to take notes, transcribe recorded discourse, and distill important information for analysis and research. Depending on the program, learners may develop structured interviewing techniques that professionals often use in educational research scenarios. The course covers modern-day approaches to education policy issues and the history of litigation involving K-12 schools and students. Degree seekers develop an understanding of legal and policy development in the 20th-century American schooling system. Case studies and examinations of pertinent laws serve as starting points for class discussion, assignments, and research projects. This course helps students understand the various issues of gender and sexual diversity in education and schools. Learners delve into gender construction and the influence of the educational system. The course presents theories and research about contemporary educational issues, including those related to sexism and homophobia. Professionals with a Ph.D. in curriculum and instruction online may wish to pursue further certifications. These credentials increase your employability in specialty areas of the field or allow you to seek jobs with public and private schools. Additionally, certifications can increase your earning potential. Most states require professionals in educational and administrative roles in the school system to possess a teaching or administrative certification. Ph.D. holders with a certification in a specialty area may also pursue jobs as departmental chairs at the college level or find employment as a specialist in grade schools or high schools. The following three certifications may prove useful for professionals with training in curriculum and instruction in varying career tracks. Curriculum Specialist Certification: Ph.D. holders with this credential work as school administrators and focus on improving the effectiveness of instruction at an institution. They often have teaching experience and create new curricula or revise existing instructional methods. Teaching Certification: Most professionals working in public and private schools pursue a standard teaching certification that complies with the rules and regulations of their state. This certification helps new graduates prepare for jobs in higher education and creates new teaching employment opportunities. Education Administration License: Public school professionals in most states need a teaching credential or education administrator license. Each state education board determines its requirements. In most cases, learners need a degree in an education-related field, complete a training program, and participate in supervised practice teaching experience. Professional organizations open many opportunities for those with an online doctorate in education curriculum and instruction. Undergraduates, graduate students, job seekers, and seasoned education professionals all benefit from memberships with organizations in their general field or specialty area. The annual and regional conferences organized by these associations make for exceptional networking opportunities. These gatherings also give workers in this field an opportunity to present their research, collaborate with colleagues, and establish contact with potential employers. The list below highlights some popular professional organizations for people working as teachers and curriculum and instruction specialists. American Association for Teaching and Curriculum: Founded in 1993, AATC offers members access to annual conferences that feature keynote speakers and to curriculum and teaching experts. Members use exclusive access to online journals to stay current on news and research in the field. The homepage also features an active job board. American Federation of Teachers: Founded in 1916, AFT represents 1.7 million members worldwide. The association features five divisions, including pre-K through 12th-grade teachers; paraprofessionals; higher education faculty and staff; federal, state, and local government employees; and nurses and other healthcare professionals. Members take advantage of daily updates, a job board, e-newsletters, and online networking opportunities with others in their specialty area. Association for Supervision and Curriculum Development: Based in Virginia, the ASCD boasts over 113,000 members from 129 countries. Superintendents, principals, teachers, and students take advantage of the organization’s online webinars, school and office supply discounts, career coaching services, and legal advice. The group also hosts annual leadership conferences, including meetings focused on teaching excellence and educational leadership.